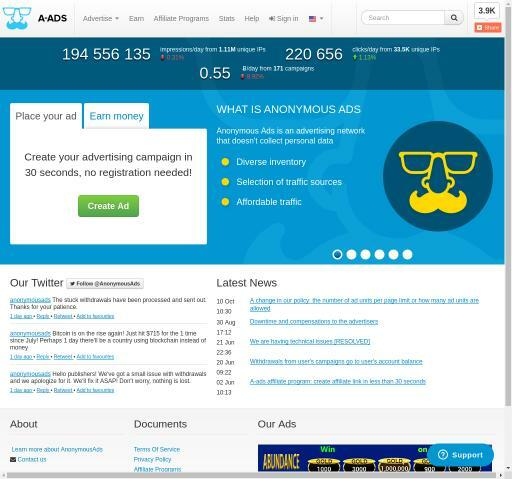 Anonymous Ads provides Bitcoin advertising campaigns easy with no need for registration. As an Advertiser with Anonymous Ads, you will not pay for fake clicks or impressions and the set up of your campaign can be done in one minute. As a Publisher, with Anonymous Ads you benefit from automatic withdrawals and there is no need for complicated programming skills, you just need HTML and CSS regardless what website you choose. For Anonymous Ads, transparency is a key factor and you will be aware of the costs from the beginning because their advertising package is listed with all the details and what it will provide. Check the reviews of Anonymous Ads on Affbank and the Information section to find out what Pricing Models they have, their Advertising Formats and Targeting Options. Don't forget to get back on Affbank in order to leave your review about Anonymous Ads.